You are here: Home / Travel / Cincinnati & Greater Cincinnati / Graeter’s Mystery Ice Cream: Do You Know? Graeter’s Mystery Ice Cream: Do You Know? Do you love ice cream? In our home, everyone does, no question. While I have always enjoyed ice cream, it wasn’t until we moved to the Cincinnati area that I started my true love affair with this yummy dessert. Probably the biggest reason is one of Cincinnati’s local ice cream companies that makes some of the best ice cream I have had in my life – Graeter’s. If you have not had Graeter’s ice cream, you have no clue what you are missing! It was a delight when we could introduce their ice cream to family since they are now available nationwide! 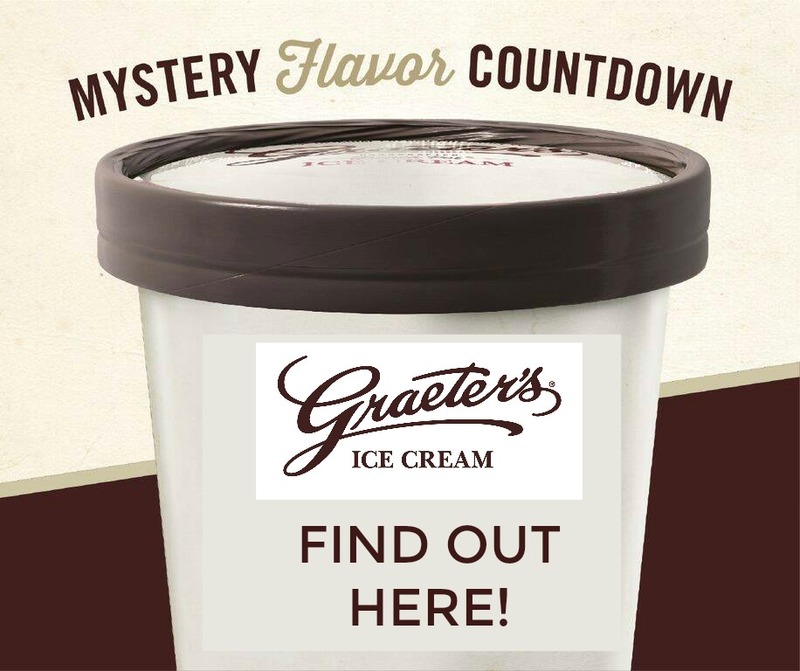 If you live in my home area of Cincinnati, you also know there is one big yearly event that everyone looks forward to – the announcement of the Graeter’s Mystery Flavor! Up until March 1, everyone was waiting in anticipation to see what this year’s new, fun flavor would be and it was a HUGE announcement in the Cincinnati area when it happened. Last year’s Mystery flavor, Cheese Crown, was such a hit with everyone that it actually ended up becoming one of their new regular flavors! I will freely admit, I was one of those people constantly watching their Facebook page on March 1, waiting to see what the new flavor would be this year and hoping it would be something truly amazing. To our delight, the flavor sounds truly wonderful – Strawberry Cheesecake! So, what do we know about this yummy favor? Well, this French pot ice cream is made using the finest strawberries and graham cracker pieces, mixed with their rich cream cheese ice cream to creature a truly rich, delightful treat for cheese cake lovers. In other words, it sounds like pure heaven! Want to try this yummy flavor for yourself? Make sure to try it as soon as you can since typically the Graeter’s Mystery flavor is only available in March and April. Currently, you can find Graeter’s Mystery flavor and other yummy favors at a store near you or visit your local neighborhood store to try some of their yummy flavors for yourself! 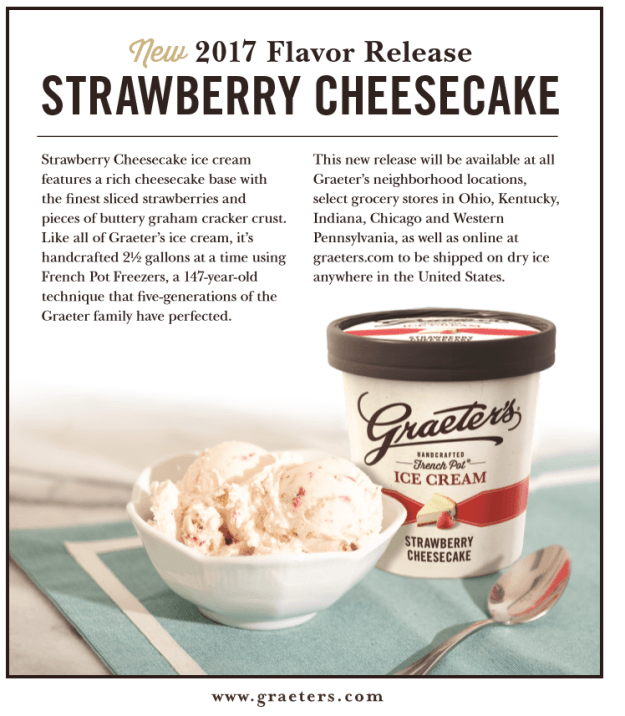 If you don’t want to wait, you can also order it online at the Graeter’s online store, where they will ship this ice cream and other amazing flavors straight to your home! Once you try it, you will see why people everywhere love Graeter’s! Strawberry Cheesecake sounds delicious. Graeter’s is my favorite brand of ice cream. I’ve never seen this brand. If I do, I’d try it. I have heard of this ice cream but have yet to try it. This gives me incentive to try it very soon. Thank you for sharing. I have never heard of this ice cream. It must not be in the stores in this part of Pennsylvania. Yummo!! One of my favorite flavors!! Cheesecake anything rocks my world!! Deeelish! A mystery flavor.. what a great idea.! I have never tried this brand but it looks good. I have never tried this brand but it looks good. I would like to get some of the Graeter’s Mystery flavor to see what it is. I have not heard of this ice cream brand before but I just looked at their product locator and found that they are carried in some of the stores I shop at.. The ice cream sounds fabulous so I want to give it a try. Yep, I love Graeter’s Ice Cream. And I love strawberry cheesecake, so I’m fully in with that mystery flavor, lol. I’ve never heard of this company. I would try their new flavor. Cheesecake has to be my all-time favorite dessert. Mixing it with ice cream sounds like a winning combo! I love, Love, LOVE ice cream!!! This sounds like amazing ice cream! I love cheesecake and I love ice cream. Sounds like a great combo! I don’t think I have ever tried this brand of ice cream, although I do love cheese cake and this ice cream looks amazing, I will have to check them out next time I am at the grocery store. Good looking ice cream I will have to try out. I love local food companies because they take much pride in their products. I’ve never tried Graeter’s but I’ll have to get some the next time I’m in Cincinnati! I have never heard of Graeter’s Ice Cream, but it sounds amazing!! I like the idea of “mystery” ice cream! My husband’s favorite dessert is strawberry cheesecake so I know he would definitely try this! I wish I could have found this for his birthday yesterday!! Your review states that this is coming to a store near you. I will be on the lookout! I wonder if they have sugar free ice cream also?? Yum!! I’m going to have to try these. They sound amazing and the mystery ice cream is a nice treat. That flavor is to die for. I love anything Cheesecake to eat. And I so love strawberries so its a win win to me. I’ve had this brand of ice cream before and really liked it! Super smooth and they offer unique flavors. Strawberry Cheesecake! A brilliant idea. They make the BESt Ice Cream! I’ve never had this ice cream. I will have to look for it. Strawberry Cheesecake sounds delicious! I’ve never heard of this brand before. The mystery flavor sounds fun – this year’s flavor sounds yummy. Our local store started carrying Graeter’s ice cream. I’ll be in the lookout for this! They had good dairy ice cream. I’ve been reading more and more about this brand, but haven’t tried it. I just looked up stores near me and there are some close by, so I’ll give them a try.